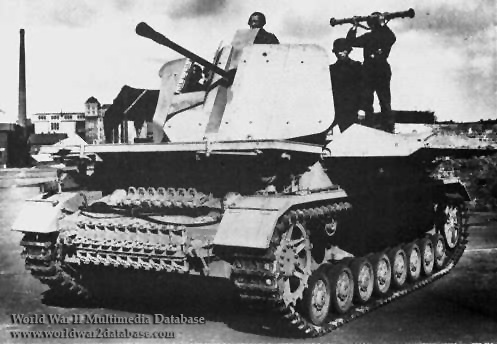 Prototype 37mm FlaK auf Fahrgestell Panzerkampfwagen IV (Sf) nicknamed "Mobelwagen." Intending to produce a unit with four 20mm guns, Krupp built this "interim solution" armed with 37mm Flak 43 L/89 cannon to combat Allied aircraft.The Möbelwagen was built on Panzer IV chassis that had been damaged on the Eastern Front and returned to the factory for repair. These were fitted with an open-top superstructure that provided the gun mount. Around the gun were mounted four hinged 20 mm armored plates. These plates had two basic operating positions: they could be lowered for full 360 degree traverse, allowing flat or low-level firing, or they could be half-closed, being pinned together to hang slightly open. In this position, they had notches that allowed the gun full rotation, but only for firing at airborne targets. Still, both of these positions left the crew extremely vulnerable. The fully closed position was only used for transport, when the plates would give the crew some protection from small arms fire and shrapnel. Production began in March 1944 by Deutsche-Eisenwerke and BMM. On April 7, 1944, the first twenty were completed and were put in service with Panzer Divisions on the Western Front by June 15. All of the 250 production units of the Mobelwagen went to the Western Front, because it proved to be an adequate interim solution while purpose-built Flakpanzers with better crew protection were being designed. Though the Möbelwagen was intended to be a stopgap, it served the anti-aircraft platoons of the Panzer Divisions extremely well on the Western Front, manufactured until March 1945. Date Estimated.